Chelsea and Arsenal have placed themselves in an early stage on Thursday for the second round of the Europa League. In the fourth group match, the 'Blues' won 0-1 at BATE Borisov, while the 'Gunners' equalized 0-0 in their own home against Sporting Lisbon. At Chelsea, Olivier Giroud crowned himself the match winner by being responsible for the only goal of the otherwise poor match in the 52nd minute. 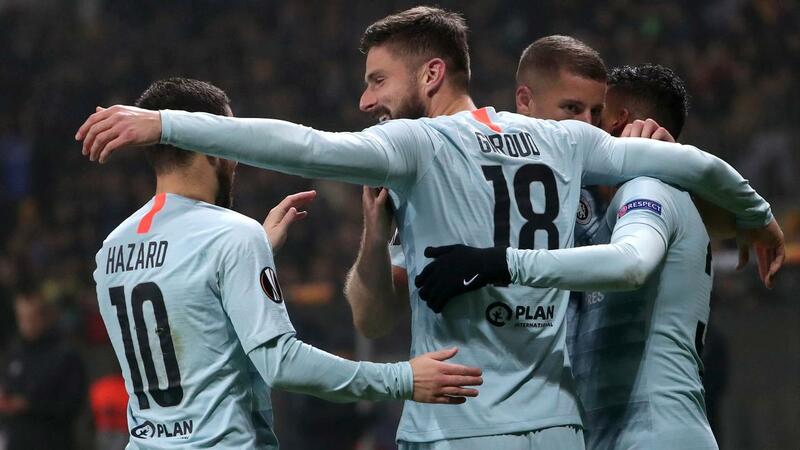 Chelsea came through twelve consecutive wins at twelve points and can no longer finish third in group L.
The team of the new manager Maurizio Sarri currently has six points ahead of close chasing Vidi (six points) and nine points on both PAOK Saloniki and BATE Borisov (both three points). Vidi won on Thursday with a 1-0 score from PAOK Saloniki thanks to a goal by Georgi Milanov in the 52nd minute. At Arsenal-Sporting Lisbon, the chances were scarce and so it was not entirely surprising that after 90 minutes the glasses were still on the scoreboard. Sporting Lisbon ended the game with a man less after a red card for Jérémy Mathieu just before time because of the break-down of Pierre-Emerick Aubameyang. At Sporting Lisbon, Bas Dost only participated in the last twenty minutes. The striker made his comeback last weekend after a long injury. Sporting Lisbon is likely to introduce Marcel Keizer as the new trainer in these days. He had his contract terminated on Thursday with Al-Jazira. Arsenal had just enough of the draw to secure a ticket for the knockout stage of the second European cup tournament. The team of the new manager Unai Emery leads in group E with ten points, followed by Sporting Lisbon (seven points), Vorskla and Qarabag FK (both three points). Qarabag won on Thursday at Vorskla with 0-1 thanks to a utilized penalty from Araz Abdullayev in the thirteenth minute. Arsenal got a bitter pill against Sporting Lisbon. Danny Welbeck fell out after half an hour and is feared that he has broken his leg. In group G it can still go in all directions. Villarreal, Spartak Moscow, Rangers FC and Rapid Wien have plenty of chance to win a ticket for the knock-out phase. Rapid Wien and Villarreal played scorelessly equal in Austria (0-0), while Spartak won Moscow in a show in Russia with 4-3 from Rangers FC. Spartak Moscow came three times behind, but eventually came to the longest by the winning 4-3 of Sofiane Hanni in the 59th minute. Villarreal leads with six points, followed by Spartak Moscow, Rangers FC (both five points) and Rapid Wien (four points).